How signals are initiated upon antigen binding to the BCR is not completely understood and is still a matter of controversy. It has been found that the three protein tyrosine kinases (PTKs) Syk, Lyn, and Btk, as well as the adaptor protein SLP-65/BLNK and PLC-y2, are required for an optimal calcium response following engagement of the BCR (Fig. 1A) . In the absence of Syk and Btk, no calcium response is observed, but in the absence of the Src-family kinase Lyn the amplitude of the calcium response is only reduced . A synergy between Src- and Zap-70/Syk family kinases in the tyrosine phosphorylation response was also observed in cotransfection studies with COS cells . These data support the model of sequential interaction between the two PTKs and the antigen receptor. According to this model, it is thought that Lyn is preassociated with the receptor and that, upon cross-linking of the BCR by antigens, Lyn becomes active and phosphorylates the two ITAM tyrosines. This modification then leads to the binding of the two N-terminal Src homology 2 (SH2) domains of Syk to the double-phosphorylated ITAM, cross-wise Syk phosphorylation and activation, phosphorylation of several Syk substrate proteins, and progression of the signal. Recent data, however, contradict this BCR cross-linking and sequential Lyn/Syk ITAM interaction model. For example, exposure of B cells to reactive oxygen species (ROS), such as H2O2 or pervanadate (VaO43-/H2O2), results in substrate tyrosine phosphorylation and calcium flux in the absence of any engagement of the BCR by antigen . These data suggest that BCR cross-linking is not a mandatory step for signaling; rather, it seems that signal initiation is under the direct control of protein tyrosine phosphatases (PTPs) such as SHP-1, which is efficiently inhibited in contact with H2O2 or pervanadate [10-12]. In Lyn-deficient DT40 B cells, Syk becomes activated via the BCR (albeit less efficiently than in Lyn-containing cells), suggesting that Lyn is not located upstream of Syk in the BCR signaling cascade . In a new experimental system allowing the inducible coexpression of the BCR and its signaling elements in Drosophila S2 cells, it was found that only Syk but not Lyn can phosphorylate both ITAM tyrosines . Furthermore, in the presence of at least one ITAM sequence, that of either Ig-a or Ig-P, the kinase activity of Syk is strongly increased. These data suggest that initiation of signaling at the BCR involves a positive feedback between Syk and the ITAM sequences resulting in rapid amplification of the BCR signal (Fig. 1B). A key to understanding this signal amplification process is the regulation of the kinase activity of Syk. A detailed mutational analysis showed that Syk is an allosteric enzyme, whose activity is regulated by its tandem SH2 domains. Apparently, in the absence of an ITAM sequence, Syk resides primarily in a closed conformation in which the two SH2 domains block the kinase domain. Therefore, Syk in solution has only low kinase activity. However, once Syk encounters an ITAM sequence, it phosphorylates the two ITAM tyrosines and binds to this sequence via its tandem SH2 domains. This binding fixes Syk in an open, active conformation, which results in a strongly increased kinase activity. At the same time, the increased activity of Syk is focused at the inner leaflet of the plasma membrane and can rapidly phosphorylate neighboring ITAM sequences, resulting in more Syk activation and rapid amplification of the signal (Fig. 1B). This amplification process occurs even more efficiently inside an oligomeric BCR complex where ITAM-containing sequences are located close to each other. This Syk activation model is supported by the phenotype of a Syk mutant carrying a C-terminal SH2 domain deficient in ITAM binding. This mutant is nearly as deficient in tyrosine phosphorylation as a kinase-dead mutant of Syk. 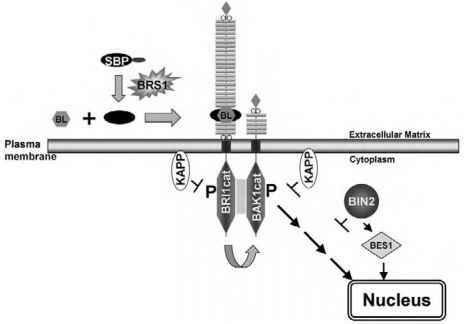 Another important protein controlling initiation of the BCR signal is SHP-1 . This PTP was previously thought to play a role only in the termination phase of signaling by dephosphorylating PTK substrates. However, we found that the Syk/ITAM signal amplification process can occur only at the BCR under conditions where PTPs are absent or inhibited. In the S2 cell system, the Syk-mediated signal amplification at the BCR is completely prevented by coexpression of SHP-1 . In this system, the inhibitory function of SHP-1 seems not to be due to a dephosphorylation of Syk but rather to the dephosphorylation of the dual-phosphorylated ITAM, which removes the sequence required for the allosteric activation of Syk. Thus, signal initiation at the BCR not only involves activation of a kinase but also inactivation of a phosphatase. Newer studies on other receptor systems also have found that signal transduction from these receptors requires both kinase activation as well as phosphatase inhibition . Given that kinases are often activated by conformational changes, how then are phosphatases inhibited? All phosphatases carry an invariant, reactive cysteine (Cys-SH) in their catalytic center that takes part in the removal of phosphate groups from phosphorylated substrate proteins. In the presence of H2O2, this cysteine is reversibly oxidized (Cys-SOH), thus the phosphatase activity is transiently inhibited . Via the inhibition of phosphatases, H2O2 can function as a second messenger in signal transduction . H2O2 is indeed produced in stimulated B and T cells via activation of the membrane-bound NADPH-oxidase complex producing singlet oxygen molecules (1O2) which react with water to yield H2O2. Interestingly, recently it was found that the BCR and TCR, apart from their binding and signaling function, are enzymes that efficiently catalyze this reaction and thus contribute to H2O2 production [16,17]. Figure 2 The BCR and its early signaling elements establish a positive feedback as well as a double-negative feedback loop. The positive feedback involving Syk and the ITAMs and the double-negative feedback involving the ITAMs, SHP-1, and the H2O2-producing enzymes are described in the text. In principle, double-negative feedback systems have the potential to convert graded inputs into irreversible responses such as differentiation or apoptosis. sequences and a double-negative feedback between the ITAM, SHP-1, and the H2O2-producing enzymes (Fig. 2). 1. Reth, M., Wienands, J., and Schamel, W. W. (2000). An unsolved problem of the clonal selection theory and the model of an oligomeric B-cell antigen receptor. Immunol. Rev. 176, 10-18. 2. Campbell, K. S. (1999). Signal transduction from the B cell antigen-receptor. Curr. Opin. Immunol. 11, 256-264. 3. Wienands, J. (2000). The B-cell antigen receptor: formation of signaling complexes and the function of adaptor proteins. Curr. Top. Microbiol. Immunol. 245, 53-76. 4. Schamel, W. W. A. and Reth, M. (2000). Monomeric and oligomeric complexes of the B cell antigen receptor. Immunity 13, 5-14. 5. Nemazee, D. (2000). Role of B cell antigen receptor in regulation of V(D)J recombination and cell survival. Immunol. Res. 21, 259-263. 6. Kurosaki, T. (1999). Genetic analysis of B cell antigen receptor signaling. Annu. Rev. Immunol. 17, 555-592. 7. Kurosaki, T., Takata, M., Yamanashi, Y., Inazu, T., Taniguchi, T., Yamamoto, T., and Yamamura, H. (1994). Syk activation by the Src-family tyrosine kinase in the B cell receptor signaling. J. Exp. Med. 179, 1725-1729. 8. Iwashima, M., Irving, B. A., van Oers, N. S., Chan, A. C., and Weiss, A. (1994). Sequential interactions of the TCR with two distinct cytoplasmic tyrosine kinases. Science 263, 1136-1139. 9. 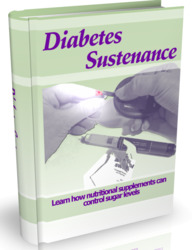 Wienands, J., Larbolette, O., and Reth, M. (1996). Evidence for a preformed transducer complex organized by the B cell antigen receptor. Proc. Natl. Acad. Sci. USA 93, 7865-7870. 10. Meng, T. C., Fukada, T., and Tonks, N. K. (2002). Reversible oxidation and inactivation of protein tyrosine phosphatases in vivo. Mol. Cell 9, 387-399. 11. Lee, S. R., Kwon, K. S., Kim, S. R., and Rhee, S. G. (1998). Reversible inactivation of protein-tyrosine phosphatase 1B in A431 cells stimulated with epidermal growth factor. J. Biol. Chem. 273, 15366-15372. 12. Xu, D., Rovira, I. I., and Finkel, T. (2002). Oxidants painting the cysteine chapel: redox regulation of PTPs. Dev. Cell 2, 251-252. 13. Rolli, V., Gallwitz, M., Wossning, T., Flemming, A., Schnamel, W. W., Zuin, C., and Reth, M. (2002). 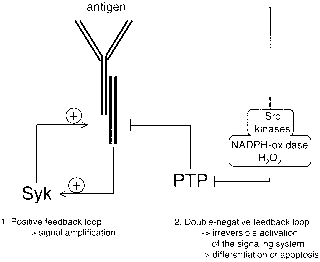 Amplification of B cell antigen receptor signaling by a Syk/ITAM positive feedback loop. Mol. Cell. 10, 1057-1069. 14. Neel, B. G. and Tonks, N. K. (1997). Protein tyrosine phosphatases in signal transduction. Curr. Opin. Cell. Biol. 9, 193-204. 15. Reth, M. (2002). Hydrogen peroxide as a second messenger in lymphocyte activation. Natl. Immunol. 3, 1129-1134. Eschenmoser, A., and Lerner, R. A. (2001). Antibody catalysis of the oxidation of water. Science 293, 1806-1811. 17. Datta, D., Vaidehi, N., Xu, X., and Goddard, 3rd, W. A. (2002). Mechanism for antibody catalysis of the oxidation of water by singlet dioxygen. Proc. Natl. Acad. Sci. USA 99, 2636-2641. 18. Ferrell, J. E. (2002). Self-perpetuating states in signal transduction: positive feedback, double-negative feedback and bistability. Curr. Opin. Cell. Biol. 14, 140-148.